The "glycemic index diet" or "GI diet" or "low glycemic diet" is more a way of eating rather than a diet. Originally developed as a tool to help diabetics manage blood sugar, the glycemic index diet has found its way into the mainstream weight loss market. What is GI (Glycemic Index)? Not all carbohydrate foods are created equal, in fact they behave quite differently in our bodies. 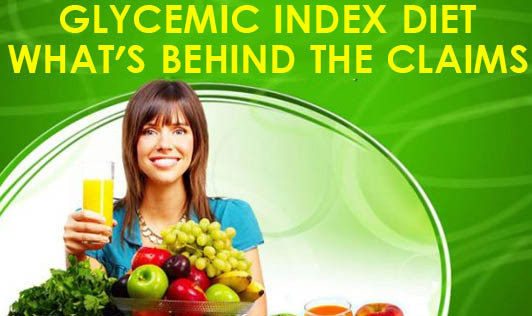 The glycemic index or GI diet is an eating plan based on how foods affect your blood sugar level. Low GI: 1 to 55 - Green vegetables, most fruits, raw carrots, kidney beans, chickpeas, lentils, and bran breakfast cereals. Medium GI: 56 to 69 - Sweet corn, bananas, raw pineapple, raisins, oat breakfast cereals, and multigrain, oat bran, or rye bread. High GI: 70 and higher - White rice, white bread, and potatoes. For example, raw carrots have a GI value of 35. This means that if you eat enough carrots to consume 50 g of digestible carbohydrates (sugars and starches), your blood glucose level after eating the carrots will be 35% of the blood glucose level after eating 50 g of pure glucose. Comparing these values, therefore, can help guide healthier food choices. • Use breakfast cereals based on oats, barley, and bran. • Use unrefined breads as they have higher amounts of fiber and a lower GI value than white breads. • Reduce the amount of potatoes you eat. • Enjoy all other types of fruit and vegetables as they tend to have a low glycemic index .This is because they contain very little carbohydrate per serving. This also applies to carrots, which were originally and incorrectly reported as having a high GI. • Eat plenty of salad vegetables with a vinaigrette (a mixture of vinegar and oil flavored with herbs and spices) dressing.